Metallica have announced that they’ll host their annual Metallica Night with baseball’s San Francisco Giants once again later this year. 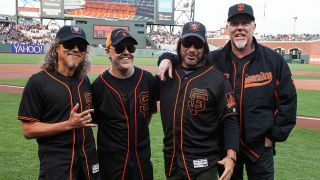 James Hetfield, Lars Ulrich, Kirk Hammett and Robert Trujillo will be at Oracle Park – formerly AT&T Park – on April 26 when the Giants take on the New York Yankees in an interleague match-up. A statement on the band’s website reads: “Mark your calendars for the seventh annual Metallica Night! On April 26, 2019 – just before we take off for our annual European summer vacation – we'll celebrate one of our favourite hometown traditions, Metallica Night at Oracle Park with the San Francisco Giants. “Members of the band will be on hand to start things off with the National Anthem and first pitch, sticking around all night to cheer on the team against the New York Yankees. Special Event ticket packages include a ticket to the game and a limited edition Metallica/Giants reversible knitted beanie. Proceeds from sales from those tickets and those for the pre-game VIP event in Triples Alley will go towards Metallica’s All Within My Hands foundation.